Organisations the world over – from public and private businesses to non-profits and government agencies – are now grappling with the effects of disruptive technologies. According to recent research from the Project Management Institute (PMI), 91 percent of organisations are feeling the impact. Meanwhile, those few that aren’t currently experiencing the effects are still preparing for disruptive technologies to change their business in the coming years. A great example of this is Caterpillar, the world’s leading manufacturer of construction and mining equipment, diesel and natural gas engines, industrial gas turbines, and diesel-electric locomotives. At present, the company is using self-driving, autonomous machines in mining operations in Australia in a bid to reinvent itself, going from a maker of heavy machinery to an IoT-connected company. Another example is TD Bank, which is working with other banks in Canada to develop an identity verification service using blockchain in order to stave off disruption from fintech companies. This wave of disruption – whether external or self-imposed – calls for organisations to assess their business models, design new strategies, leverage new technologies and rely on the successful implementation of the projects that will drive the needed change. It also shines a harsh light on the gap between strategy design and strategy implementation. Essentially, even though forward-thinking organisations recognise that disruptive technologies can help them gain a competitive advantage, many of them still struggle to implement the strategies at the scope and speed the market demands. 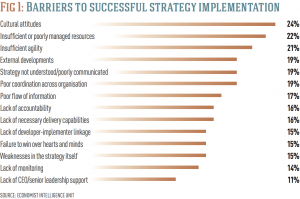 Fortunately, not all organisations struggle: there are various organisations that have proved themselves effective in delivering the strategies they have designed. Research conducted by Brightline has identified three common characteristics among them. 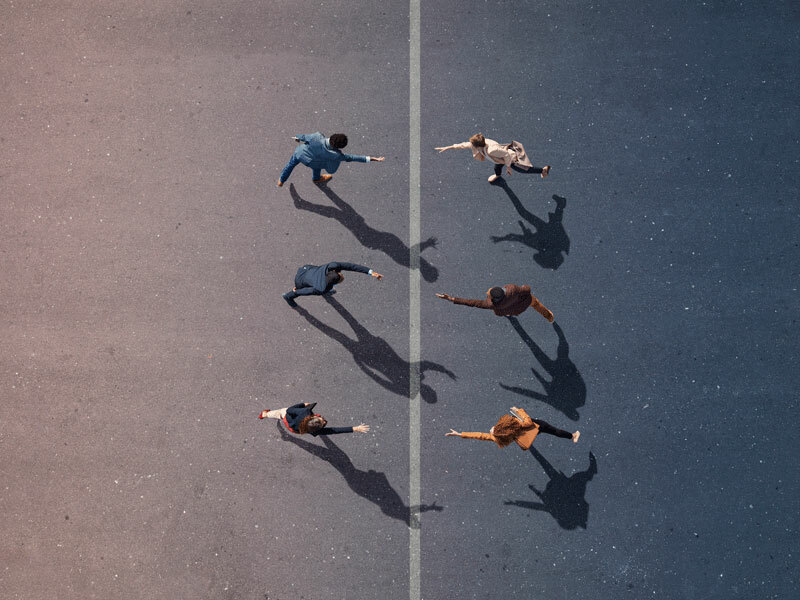 One that is they ensure that strategy design and delivery are deeply interconnected: instead of a linear two-step process, they maintain continuous interaction between the team that creates a strategic plan and the team that carries it out. Second, they understand that the effective delivery of strategy requires looking beyond the walls of their organisation. They don’t just monitor what happens in the market – they provide such insights to the decision-makers who can quickly adjust strategy and implementation in response. Finally, these organisations find a balance between short-term responsiveness and long-term vision. Leading companies create a dynamic system for delivering strategy, moving quickly to adjust their approach based on changing opportunities and risks, all while keeping the larger goal in sight. Next, it’s necessary for project players to accept that they are accountable for delivering the strategy they designed. Once the strategy has been defined and clearly communicated, responsibility shifts to overseeing the progress of implementation so that the strategy delivers results and achieves its goals. The responsibility applies to the entire senior team, Anderson explained, because the orchestration required to succeed in today’s business environment is highly complex. Accountability means knowing where change happens in the organisation and who manages the programmes that drive the change. This includes proactively addressing emerging gaps and challenges that may impact delivery. “Never underestimate the power of entropy,” Anderson said. Brightline’s third principle involves the dedication and mobilisation of the right resources. According to Anderson, there needs to be an active balance between running the business and changing the business, which are both achieved by selecting and securing the right resources for each. The specific skills needed are often different. Team leadership skills are at a premium, so the best leaders should be assigned to the most important projects. “A critical part of mobilising resources is not just assigning them, but inspiring them,” said Anderson. Therefore, organisations need to ensure that both senior leaders and employees are committed if they want big-change projects to take root. Visible backing and action from the most influential senior leaders and their direct reports are vital to inspiring a buy-in from those on the front lines. Late or inconsistent communication with staff can alienate the people most affected by change, so senior leaders should communicate with staff early and often. Anderson continued: “Of course, before you can dedicate and mobilise resources, it’s essential to know what resources you have.” She also pointed out that NASA, which deals with change and complex issues on a regular basis, assesses its talent pool based on both current and anticipated needs, and keeps track of who possesses which skill sets. Adopting this tactic can help senior leaders understand if they have the right resources as needed, or if additional resources will be required when change is implemented. In the absence of these practices, many strategic initiatives fail because leaders have become so passionate about an idea that they lose sight of how the market is evolving. Strategy may be delivered, but the result could be something that the market no longer wants or needs. Being bold, staying focused and keeping things as simple as possible is crucial, because many of the delivery challenges will be complex and interdependent. As Anderson explained, it is important to remain nimble by making sure there are enough simplifiers, rather than complicators. “Simplifiers are those people who can get to the core of an opportunity or threat, understand the drivers, deliver the information and take the action that keeps the strategy moving forward,” she told World Finance. This approach minimises bureaucracy and instead allows for the exploration of ideas, taking appropriate risks, prioritising work, ensuring accountability and focusing on delivering value. After this comes the principle of promoting team engagement and effective cross-business cooperation. “Beware of the frozen middle,” Anderson said. “Senior leadership needs to gain genuine buy-in from middle and line managers – the people who run the business – by engaging, activating and empowering them as strategy champions.” It’s a common mistake for senior leadership to rely too heavily on traditional managers and supervisors, who might be given responsibility or assumed to be playing a certain role only because of their title, rather than sharing and dividing responsibility between those who are respected by their peers for other reasons. When necessary, teams can break down silos, add diversity to the creative process and generate responsiveness that creates more value than what individuals could create on their own. Care must be taken to craft teams – whether from internal or external talent pools – with the right mix of capabilities and skill sets, while the conditions that allow people to work collectively as well as individually must be explicitly set. “Where appropriate, give the right individuals the authority to make decisions and drive execution on their own,” Anderson told World Finance. Demonstrating bias towards decision-making and owning the decisions made are both crucial. Making decisions isn’t enough; follow-through is needed all the way to delivery. One way to do this is to build a lean and powerful governance structure to reinforce accountability, ownership and a bias towards action, based upon pre-agreed metrics and milestones. “That means committing to making strategic decisions rapidly, moving quickly to course correct, reprioritising and removing roadblocks,” said Anderson. It’s likely that leaders will not have all the information they would like, which means they have to rely on others to deliver reliable input. In turn, this will enable them to make thoughtful decisions. During this process, risks and interdependencies must be considered and addressed explicitly – both upfront and regularly throughout delivery. When leaders act fast and with discipline, they encourage prompt and effective reallocations of funding and personnel among strategic initiatives, as well as rapid adjustment when implementation reveals new risks and opportunities. Number eight of Brightline’s Guiding Principles is to check ongoing initiatives before committing to new ones: it’s critical that senior leadership resists the temptation of declaring victory too soon. “Change fatigue affects even the most senior and seasoned executives,” Anderson explained, noting that with the right governance, leadership, rigour and reporting capabilities in place, regular evaluation of the organisation’s project portfolio can help maintain focus and discipline. Implementing new initiatives in response to fresh opportunities should only occur when there is a clear understanding of the existing portfolio and the organisation’s capacity to deliver change, together with the assurance that those initiatives are aligned with the strategy. Any issues that are discovered must be actively addressed. In the long term, strategic initiative management discipline – which is critical for the effective orchestration of a dynamic initiative portfolio – will only work if robust assessment, support and course correction are all in place. Last but not least is the 10th principle: celebrating success and recognising those who have done good work. As leaders get involved in the day-to-day work associated with strategic initiatives, they may overlook the importance of taking the time to acknowledge people and their contributions. “The simple act of writing a thank you note can have a big impact,” Anderson told World Finance. “I set aside time every week on my calendar to do this, to ensure that this critical last step doesn’t fall by the wayside.” She has also observed that word gets around when senior leadership shows that kind of interest and appreciation. Equally important is generous and public acknowledgement of those who demonstrate the leadership behaviours and programme delivery capabilities that make a strategy succeed. Asking them to share their experiences motivates and educates everyone and pays off exponentially. Just as the human element makes change possible, it can also make the process of strategy delivery messy and complicated. People have different interests, motivators and levels of tolerance, which influences their behaviour and can create potential misalignment. In fact, according to research carried out by Forbes Insights, 94 percent of those surveyed said they face challenges when trying to create a culture of change. Meanwhile, 38 percent of respondents said employees see change as too much of a threat and even fear losing their jobs. For instance, international staffing company ManpowerGroup prioritises open communication across its firm to make the value of new technologies clear to the very people who will be affected by them. With AI, the benefits of automating customer conversations are emphasised – specifically, contact centre agents are freed up to focus on more mission-critical tasks. Even when people are convinced that changes are in the collective interest, their individual behaviours may not align if the personal cost of change seems too great. “Management needs to look out for entrenched behaviours and create the conditions needed to make change individually desirable, all the while ensuring it aligns with the broader interest,” said Anderson. It is also essential for leaders to treat their teams with respect, while remaining explicit and resolute about the consequences of not participating in the new behaviours or reverting to old ways of working. Not everyone will be able to make the necessary changes, but it is in management’s best interest to try and get everyone on board. The advancement of the Brightline Initiative’s 10 Guiding Principles and its People Manifesto coincides with significant changes for project professionals – those at the centre of strategy implementation. Indeed, both can help executives understand how to best leverage the key talent that project professionals represent. The recognition of the importance of project management skills for successful strategy implementation marks a significant shift in C-suite thinking, according to Anderson. Previous PMI evidence (both quantitative and qualitative) has found that executives did not tend to focus sufficiently on the opportunities and capabilities that project management skills represent. Indeed, people with such skills often support and even embrace frequent change, thereby better positioning themselves and the organisations they work for to compete and succeed in a fast-paced, disruptive business environment. Another significant change for the profession is how project leaders are perceived and deployed within organisations. Project leaders are taking on roles that demand greater accountability, not just around traditional areas such as budget, timelines and resources, but around the full delivery landscape. Their role is expanding to that of an innovator, a strategic advisor, a communicator and a versatile manager. For organisations to win at disruption, executives must learn to manage the influx and influence of disruptive technologies, and must invest in the relevant talent. No organisation can prepare for each and every eventuality, but they can sharpen their ability to respond to the inevitable challenges that arise as they implement what they thought was a well-constructed strategic plan. And while organisations may be able to articulate their strategy for dealing with disruptive technologies, doing so will be meaningless if they fall short when it comes to executing against that strategy.